With nary a celebrity in sight (it is spring break, after all) Michael’s was a sea of suits and socialites today. 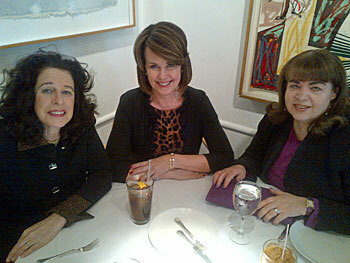 I was glad to be joined by power gals Susan Fine, president of her own real estate development firm, Oases Development and Lisa Linden, CEO of LAK PR, who counsels many of the city’s top movers and shakers and, it should be said, has the best collection of Hermès handbags in all of New York. (Her latest acquisition, a purple ‘Jige 29’ clutch, is to die for!) When Lisa suggested I meet Susan to hear about her latest project, TurnStyle, the much-anticipated $14.5 million marketplace and food court with over 30 swanky shops, dining options and a performance space (!) located on the concourse level of the Columbus Circle subway station opening next month, I was intrigued. Since my last visit to the subway occurred in 1990 (the less said about it, the better), I thought it might be time for an update. Susan’s CV is full of landmark real estate projects, from the World Financial Center to the retail reinvention at Grand Central, which she shepherded as the head of real estate for the MTA. Now, as Lisa put it, Susan is “glamming up” Columbus Circle. “It’s transformative, flawless design.” Last week, David Dunlap heralded the space as “a new home for underground gourmets” in The New York Times. In explaining the art — and science — of creating the right mix of merchants, Susan told me it’s all about creating a “family” that “isn’t expected.” To that end, TurnStyle will be a hub of tastemakers including “six female-owned businesses, three vegan/organic merchants” and no Dunkin’ Donuts or Subway. Upscale retailers who are going underground include hipster favorites Dylan’s Candy Bar and Project No. 8. The culinary cast is impressively diverse with Casa Toscana, Doughnuttery and Semsom, a Lebanese restaurant run by sisters Carine Assouad and Christine Assouad Sfeir in the mix. “I also gave a store to Greyston Bakery [whose profits support their community-based non-profit initiatives. ]” Food merchants, she explained, “will feature different kinds of food at different times of day” to appeal to commuters, tourists and school kids. “You have to think about what slows people down [in order to eat and shop] and what do they need?” Leases specify that stores need to remain open at least 12 hours a day. The press will get their first look at the 325-foot long passageway on the train platforms at 59th and Columbus on April 19 when the VIP first tours will be conducted before the barricades come down and the public is invited in during the evening commute.